So—take some time from the busyness of life that we all share and let’s regroup. Let’s focus on where we all long to be when we are not there. Let’s celebrate coming home. Each year when our Wilson Living wedding issue rolls around, you can find me doing the same thing. Shaking my head and wondering what I can share about home and design that’s relevant to weddings. 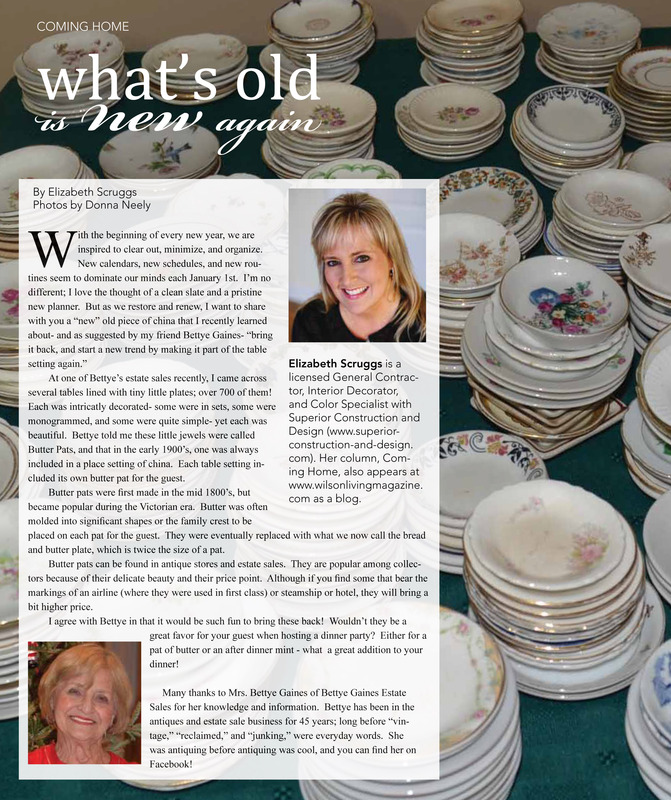 One year, my column was on preserving mementos; last year, it was about readying your guest room for wedding guests. However, this year’s topic became very clear to me when participating in Wilson Bank and Trust’s Southern Home and Garden Expo a few weeks ago: color. Everyone wants to know about color. What color is popular? Which colors are trendy? How do I choose the right paint color? Help, I chose the wrong paint color! These are just a few of the color questions I heard during the weekend at the expo. In fact, this was my fifth year there, and I had more questions about color this year than any other year. But that suited me just fine because I love color, and I love to talk about color. So how does this tie into the wedding issue? By examining the predominant color of weddings that also happens to be all the rage in interiors right now: white. White sounds so simple and easy, and it can be, if you learn a bit about selecting it first. White is not just white. There are literally hundreds of shades of white. To choose the correct shade of white to use in your home, you must first understand the undertones of white. The fifth undertone of white is gray-white, which can actually appear greige. 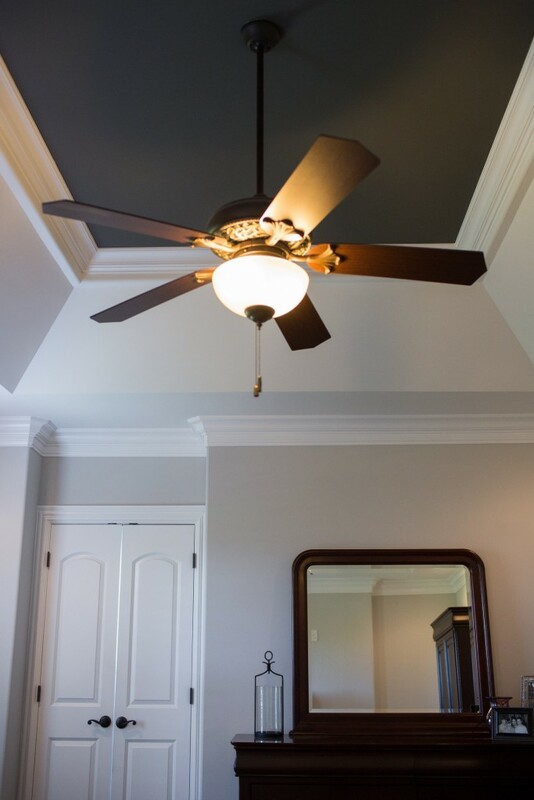 Whites with an undertone of gray are never a good choice for millwork or ceilings because they will appear dirty. Gray whites are an option best left for walls, and I’ll address that next. 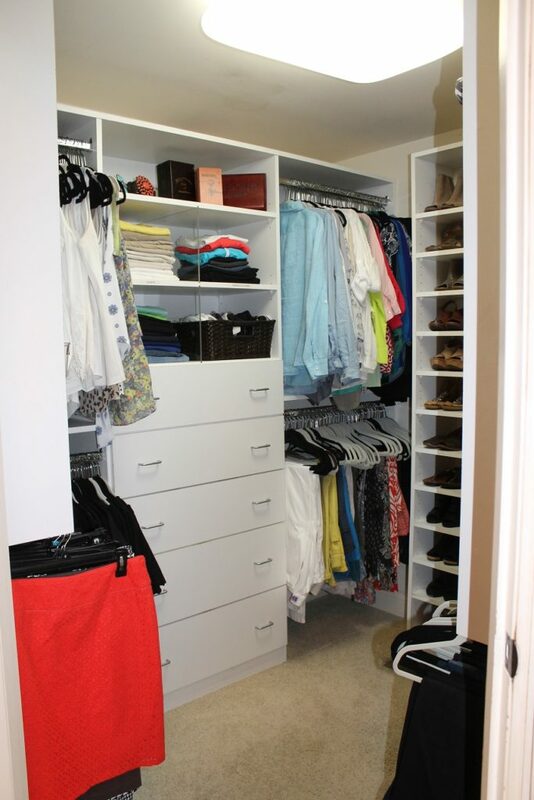 Simply know that when choosing white for a space, it will typically be found in one of the Top 4 categories. If you are selecting a white for an existing space, you must first determine the undertones of the fixed elements of the space. What are fixed elements? Anything that is “fixed” in the space and cannot be easily moved or changed is a fixed element. 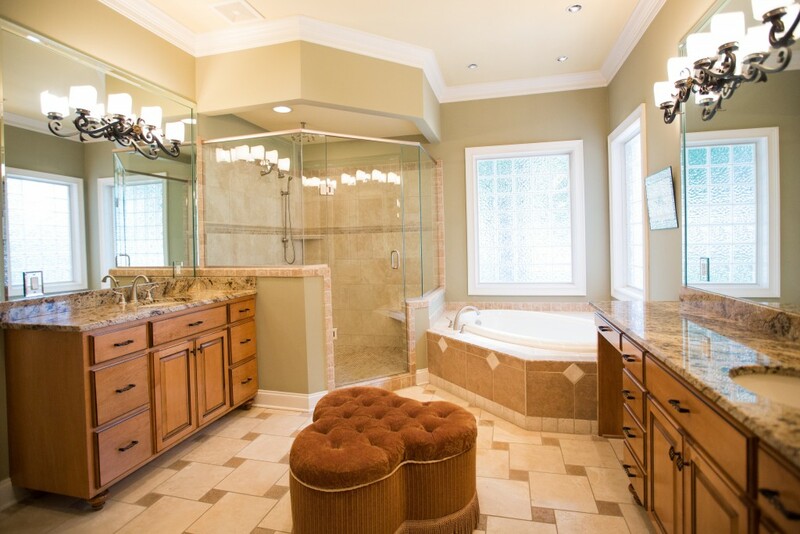 Examples of these would be wood flooring, tile flooring, stone countertops and carpet. 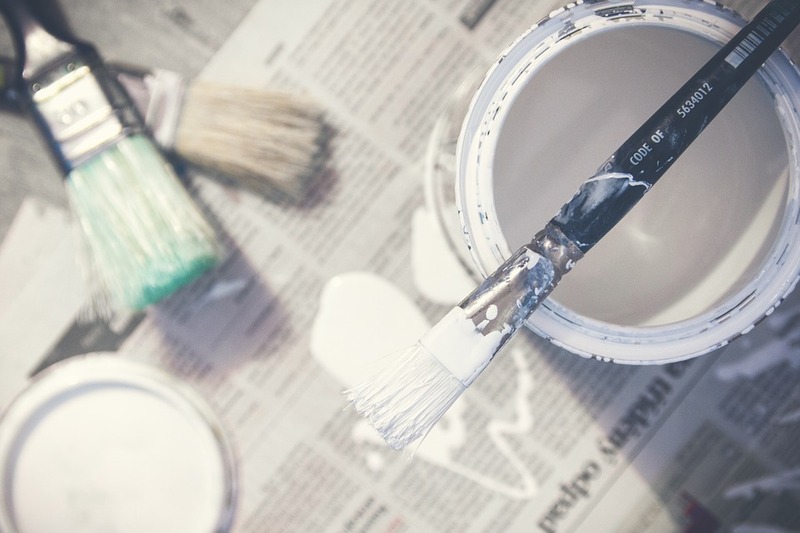 Look to these elements to discern what whites and undertones already exist in them, and that is how you will choose the category of whites from which to select your paint color. Once the undertone category has been selected, you must then compare and contrast whites in the category against the fixed elements in the space, and it should be very apparent which white to select. Comparing is best done against a true white, one with no discernable undertone. I use Benjamin Moore Chantilly Lace BM OC-65 when comparing and contrasting whites. If selecting a white color for millwork, ceilings or cabinets for a new build, it makes it a bit easier, but you should always select the fixed elements first before ever selecting paint colors. But what about white walls? They are currently trending in every shelter magazine, all over Pinterest and on popular decorating websites and blogs. And personally, I think there is nothing as beautiful as white/greige backdrop with well-selected accessories that pop against it. But again, understanding the undertone of the white is key. White walls should only be used in rooms with plenty of natural light. Using white in a space that does not have abundant natural light will make the room look dim and dirty, not light and bright. Those beautiful images online and in magazines? They were professionally photographed by a photographer who specializes in interior photography, with an understanding of light and how to capture the shot to get the most appealing results. That doesn’t mean the specified color does not work in that particular space but that you need to make sure you have adequate light to support white. I’ve only touched on color selection, but if you use these general guidelines, you should be able to get white….right! If you still lack confidence, give me a call. I’ve been trained in color specification by the very best in the business, and I’d love to help you. The chart below gives examples of each of the categories I mention, and it’s easy to see the undertones as they are beside each other. new- like we’ve been given a clean slate and anything is possible! We all make the usual resolutions, and inevitably one of those is always to get organized. Statistics show being organized saves time AND money—and who among us doesn’t want more of both?? But even the simple word ORGANIZE strikes fear into many. It seems daunting and overwhelming…. like another job we have to fit in our already over-packed schedules. But truthfully, if we set aside a small block of time to invest in ourselves, the benefits would positively affect almost every aspect of our lives. 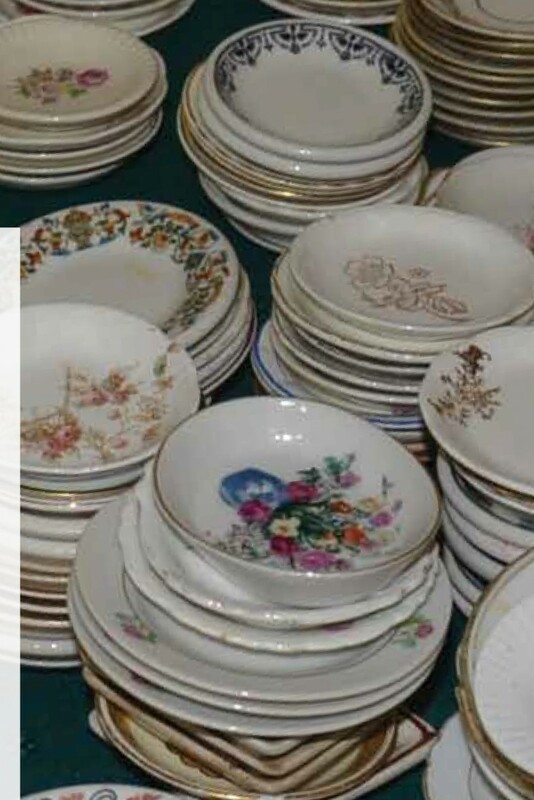 Often, by the time someone calls me for help with their space, they are so overcome with the state of things- they have no idea where to start. Such is the case in the photos below. This client is one of the top women in her field—in the ENTIRE United States—a certifiable rock star in her company. She is one of the most intelligent and dynamic women I know, and I aspire to be like her. 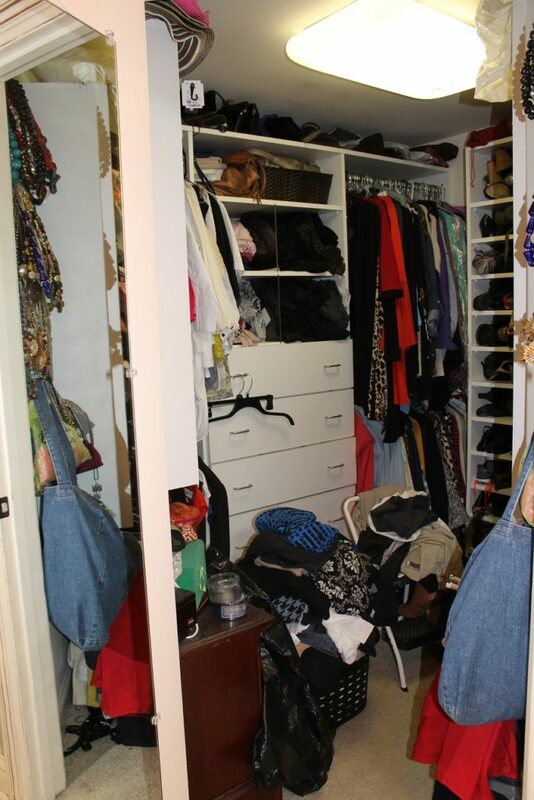 Yet due to the simple lack of systems in her closet, it had become an overwhelming area to her. P– purge ruthlessly. If you have not used or worn the item in the last nine months, odds are that you are not going to. A– assign everything a home. C– contain like items together. E– equalize everything. When the process is complete, if something new comes into the area, another item leaves. Here’s another fun fact: we wear 20% of what we own 80% of the time. Keep that in mind if the area you are editing is your closet, and let go of all items you’ve been hanging onto for whatever reason. If your physical space is in disarray, your mental space is as well. As you are working on your space, remember that you are investing in yourself. You are saving yourself time (looking for misplaced items), money (saving yourself from replacing those misplaced items), and stress (associated with both of the above)- and that, my friends, is a wise investment! Nestled under a canopy of mature trees on an estate lot in Five Oaks, Roy and Tamara Lampsa built their unassuming house. Backing up to the Troon-managed golf course, with a winding path through the trees leading to the clubhouse, they built their home after scratching out the initial design on a napkin with their architect; stating one of the most important features to them was for the exterior to be modest and unimposing. Relocating here with his career in the truck dealership industry, the couple moved across the country- leaving their family, their friends; their life– and putting it all in the hands of our little town. The Lampsas’ thought they chose Lebanon, but a decade into our friendship, I feel that maybe, quite possibly- Lebanon chose them. Moving to Tennessee was not their first long-distance move with his career. Roy and Tamara were born, raised, and married in Wisconsin, but early in their married life, they moved to Albuquerque with their two young daughters, making it their home for 14 years. The opportunity to move to Tennessee arose after their girls were in college, so it made it a bit easier for another cross country transition. Knowing them as I do, with their sense of family and community, I know this was a difficult decision for them. But, oh how things have a way of working out. Soon after moving to Lebanon, Tamara became involved with many causes- but one in particular has literally changed the lives of countless members in our community. 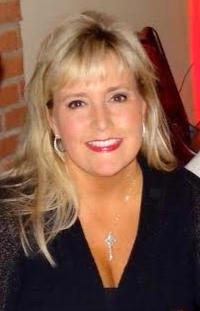 When Tamara heard of the untimely passing of a friend due to colon cancer, her heart was heavy. She felt a sincere calling, a need, to do something. Reaching out to her friend’s husband, Tamara suggested an event to raise money in his wife’s memory to help families in Wilson County struggling financially with this disease. In the beginning she wasn’t sure what to do- a run possibly? She had lots of ideas brewing- but she felt this was what she was meant to do. Several months later, with the help of friends and family, the first Sherry’s Run was held in September 2004. As of 2016, Sherry’s Run has raised over two million dollars and become an entity of its own, complete with an office location and staff. And most importantly to Tamara, every dollar raised stays in our area. Roy and Tamara have made a wonderful life in Lebanon, and consider themselves the lucky ones. Their Christian faith and values are an extremely important part of their life. They are active members of Lebanon First United Methodist Church, enjoy a devoted circle of friends, and count their church, family and community among their greatest of blessings. On September 12, 2011, which was also Sherry Whitaker’s birthday, Tamara and Roy were blessed with their first grandchild, Camden. Each year the run continued to grow, but the pull between her love for the organization and the love for her grandchildren made it exceedingly difficult for Tamara. She eventually made the decision of trading in the title of “Chairperson” for the title of “Bopi” (grandmother). These days, Roy continues advising in the trucking industry and with truck dealerships. They both enjoy being able to travel back and forth between their daughters’ homes, and helping their girls and son-in-laws care for their four precious grandchildren. Nicole and her husband Gary live in San Francisco, with their children Camden (4) and Gerrit (2); daughter Shannon, and her husband Kyle, live in Indianapolis, with their children Karsten (3), and Samantha (9 months). Being able to travel and enjoy their grandchildren, they feel it’s time to downsize their “permanent” home. We so hope they are able to stay in Lebanon and purchase a home that will be easier to maintain with their busy schedule. How could they know those many years ago that the decision they made to move east would affect so many? How could our community know that one person could conceive and establish such a loving organization? Our hearts have a way of leading us sometimes, and in this instance, the Lampsas were truly…..Coming Home. To find out more about the house or to set up a showing, contact RoyLampsa@gmail.com. I think most of us would agree that when it comes to transforming a space, the quickest (and oftentimes least expensive) way, is with color. A $30 gallon of paint holds within its realm so much possibility. Fresh, new, possibility—and this is the time of year we all want that! Color is such a powerful thing. It has the ability to affect our mood, our thinking, and even how we associate things with one another. That’s why I’m always baffled when someone puts more thought into what they are having for lunch than what colors they are going to paint their home. Let me fill you in on a little secret… there is no magic paint color. Sorry to be the bearer of bad news, but it doesn’t work that way. 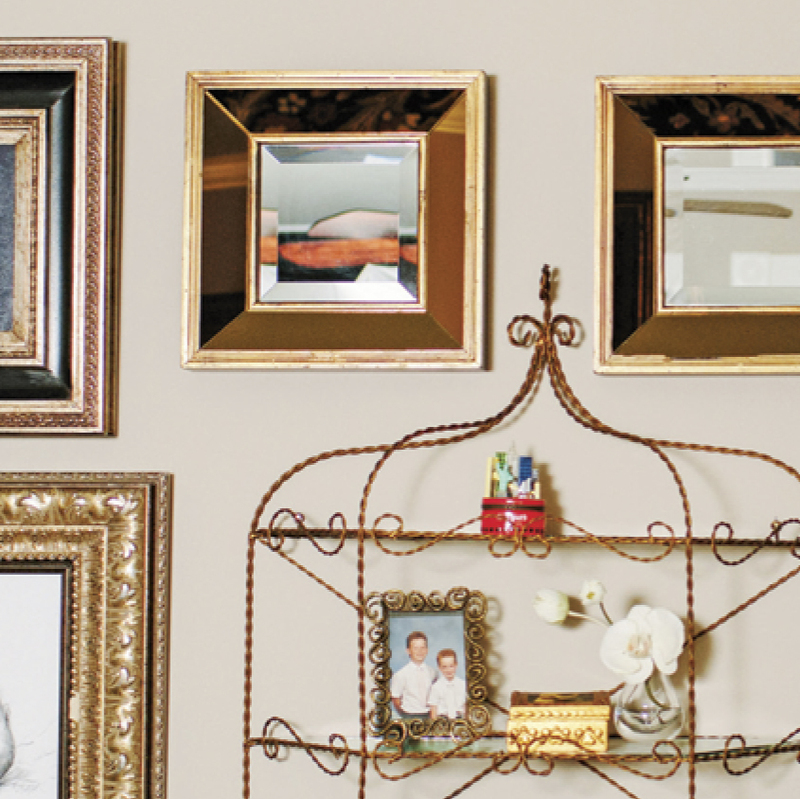 What you have to discern when painting a space is undertone and placement. THIS is the secret. This is why your friend’s color doesn’t look good in your space. If you don’t take into consideration the undertones of the fixed elements in the space, the lighting and its direction in the space, and the placement of the color in the space; it will read wrong every single time. Here are a few examples on one of my current jobs. 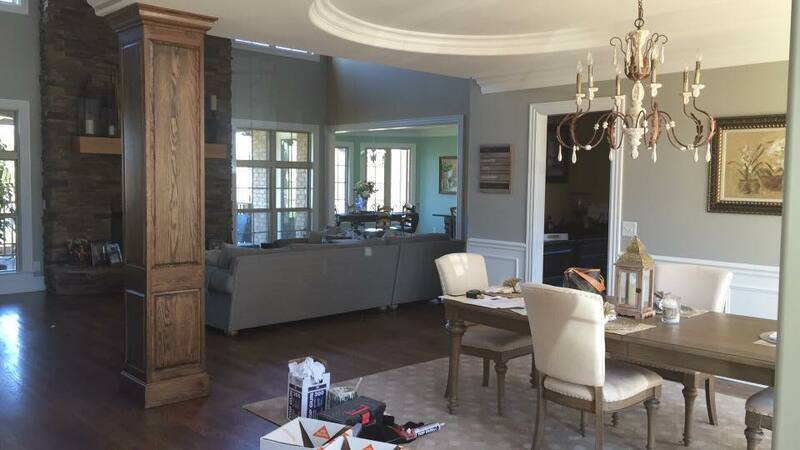 My client has lived in her beautiful home for a couple of years, and she was so spot-on in the selection of all her millwork and detailing of her new build. However, when I initially consulted with her, she said it she didn’t feel as if it were warm or pulled-together. As we walked room to room, she began to tell me she didn’t like this color or that color, and before leaving she asked me to paint wherever I felt might need a fresh look. It wasn’t that she needed a fresh look, it was that the colors chosen needed to work cohesively with the beautiful detailing of the home. The first room you see when entering the home is this beautiful dining room with a radius window wall and curved tray ceiling. However, instead of noticing the detailing in the windows and radius, your eye is drawn to the division in the wall with contrasting warm and cool colors working against each other on either side of the chair rail. By simply extending the wainscoting to the other side of the cased opening and painting it out in the trim color, the space instantly changes and all you see are the details, not the paint. Viewing the dining room from the foyer, you immediately notice the stained column. This architectural feature was placed in the house and plan for support, and to define the parameter of the dining room. By staining the column, it disappears into the den beyond, fades into the stone of the fireplace, and shows no relation to the dining room. 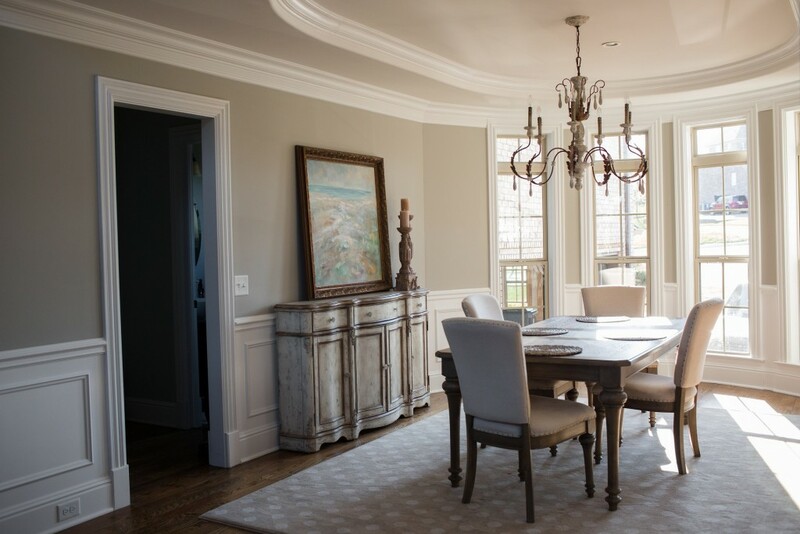 However when painted out in the trim color, it provides definition to the space and anchors the dining room. 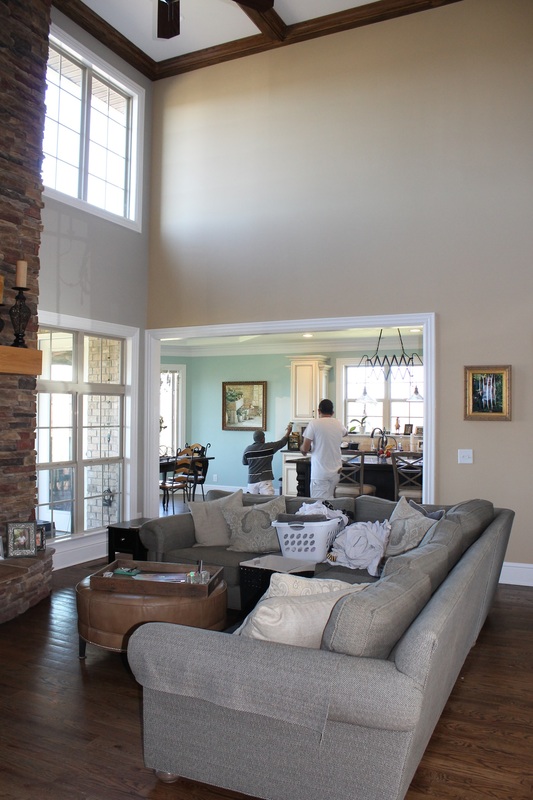 In this great room view, there are three colors with three very different undertones. Identifying them, and choosing hues with complimentary undertones make the new colors work together instead competing with each other. This was a hard sell to my client, Ginger, because she loved her blue in the kitchen. But I believe, if asked, she would say this is one of her favorite changes. 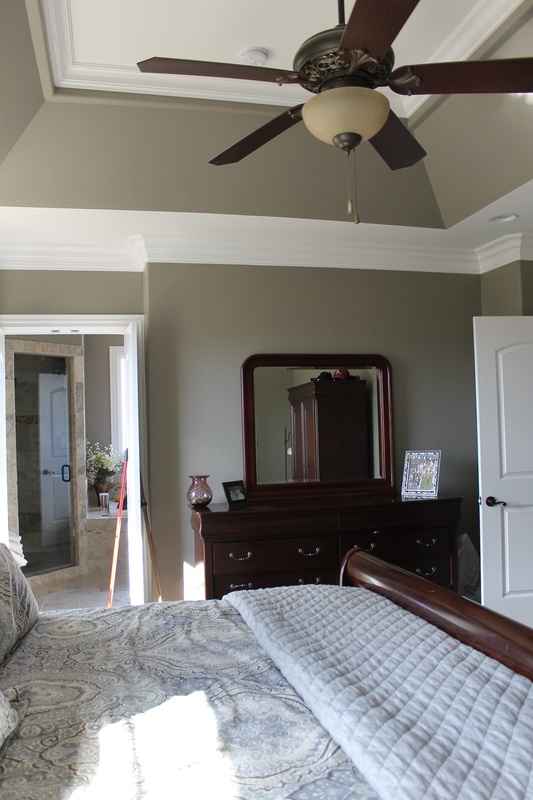 In the master bedroom before, the placement of the dark color on the wall and in the tray ceiling created division in the space. By lightening the walls, and raising the dark hue to the ceiling draws your eye up, and makes this large room seem even larger. Many thanks to my clients, Brad and Ginger Raines, for allowing me to share their incredible home with Wilson Living readers. As of press time, we were not completed with this project. If you want to follow our progress, like Superior Construction and Design on Facebook to see the rest of this breathtaking home. It was especially fun to feature Ginger’s home as she is a mutual client of mine and my Wilson Living: Coming Home photographer Chesley Summar’s. It’s wedding season! And with that come at least some out of town guests. Make sure they feel welcomed with these few easy steps to get your guest room guest ready! This may sound simple, but wash the bed linens. Even if already clean, nothing smells or feels better than freshly laundered sheets on the bed. Take inventory of your pillows, and replace any lumpy or mismatched sets. 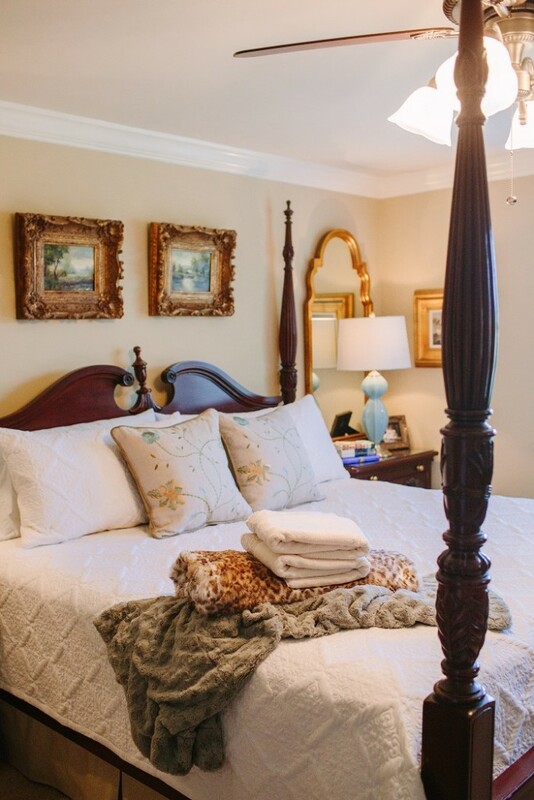 Place extra towels, linens, and blankets at the foot of the bed. 2. Place some bottled water and mints by the bedside. 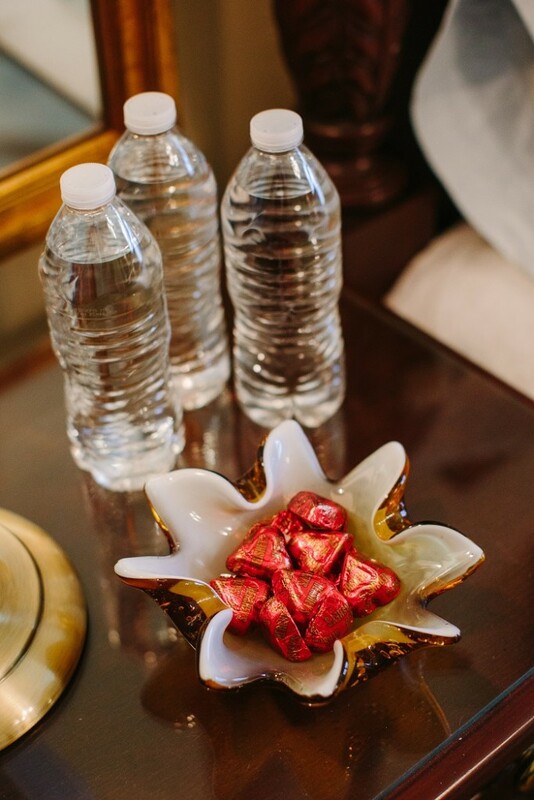 When guests are in your home, no matter how much you offer, usually they won’t “help themselves.” Providing refreshments in the room allows them to relax and refresh before the next wedding outing. 3. Fresh flowers or foliage add warmth and life to the space. 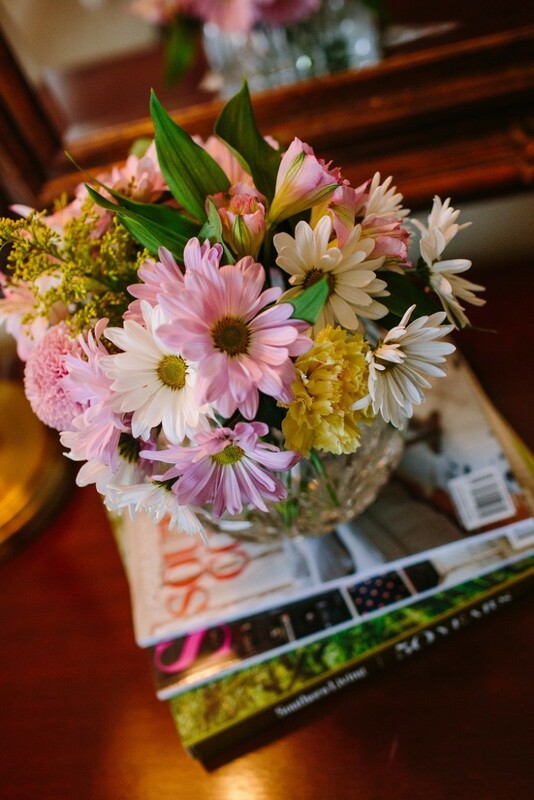 A simple bouquet from the grocery for under $10 cut and arranged in a crystal vase adds a bit of grace and elegance. 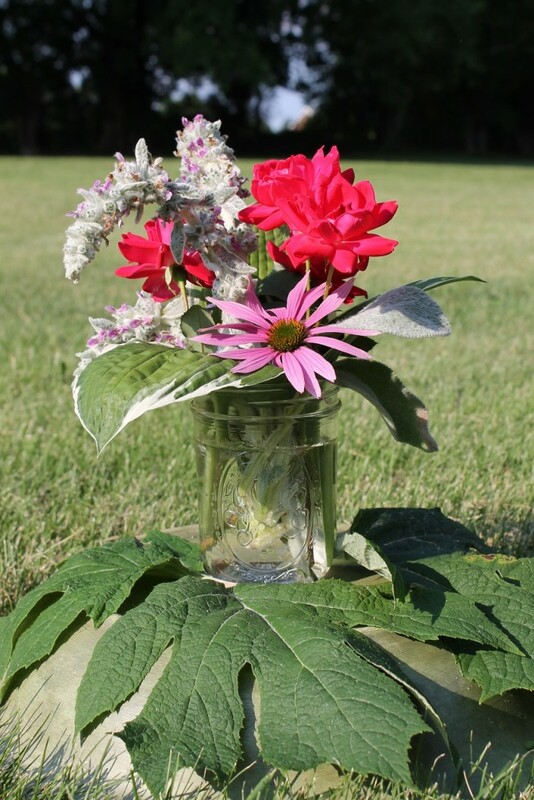 If your guest are visiting for a more casual wedding, place them in a Mason jar or antique pitcher. 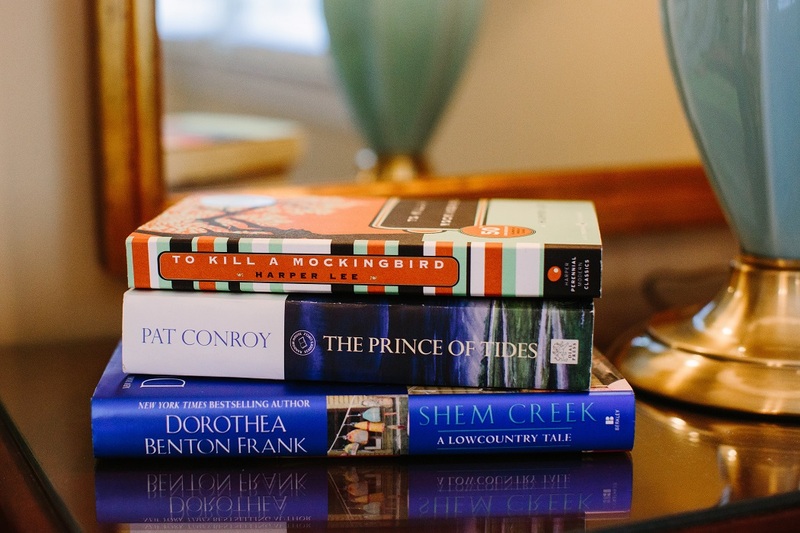 Add books or magazines about your region or town if they have not visited before. 4. Have plenty of toiletries on hand by picking up some trial sizes at the store of often forgotten necessities. Add a candle or two for a relaxing evening. 5. Stack current best selling novels on the nightstand for late night reading. As with anything, it’s the attention to details that count. 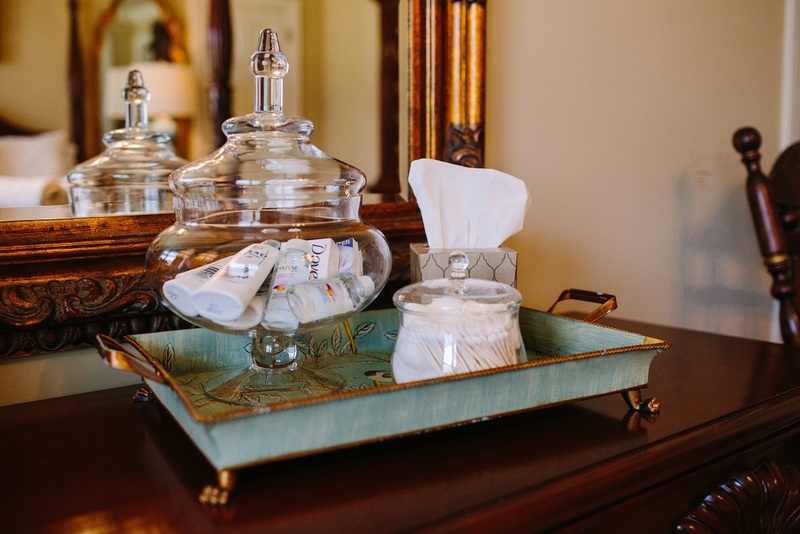 A few simple and inexpensive steps will let your guests know that you care and are happy to have them in your home. 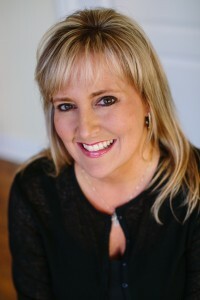 Elizabeth Scruggs of Superior Construction and Design contributed this column to the Jan-Feb issue. We all drool over Pinterest worthy tablescapes and dream of having a perfect holiday home, but when it comes down to it- who has the time OR money to create such lavish spreads? It’s fun to flip through the pages of your favorite magazine to find inspiration for the holidays, but what I’m looking for- and what I hope we’ve created for you here- is something real, something easy to duplicate, and something that uses items you already own. I put this table together for Wilson Living’s holiday party using greenery from my yard, my big boys’ childhood sled, and assorted holiday decorations I already own. When decorating, think outside the box using items you own in a different way- and when in doubt, always use fresh foliage. It adds color, texture, and even aroma- and that’s something you can’t buy! Use a minimum of colors to keep things simple and unified. This table featured classic red and green, punctuated with black and silver. 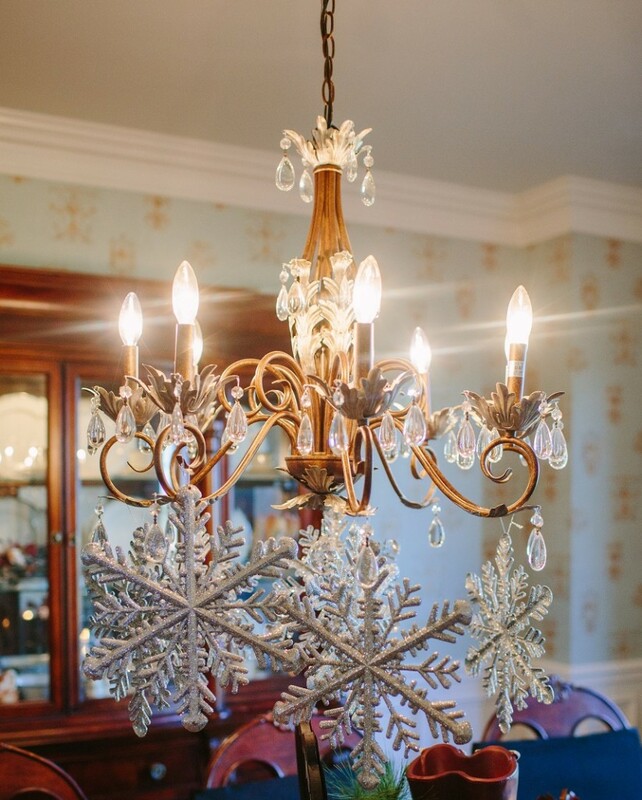 Add sparkle with candlelight and hang glistening ornaments from the fixture to help reflect light. 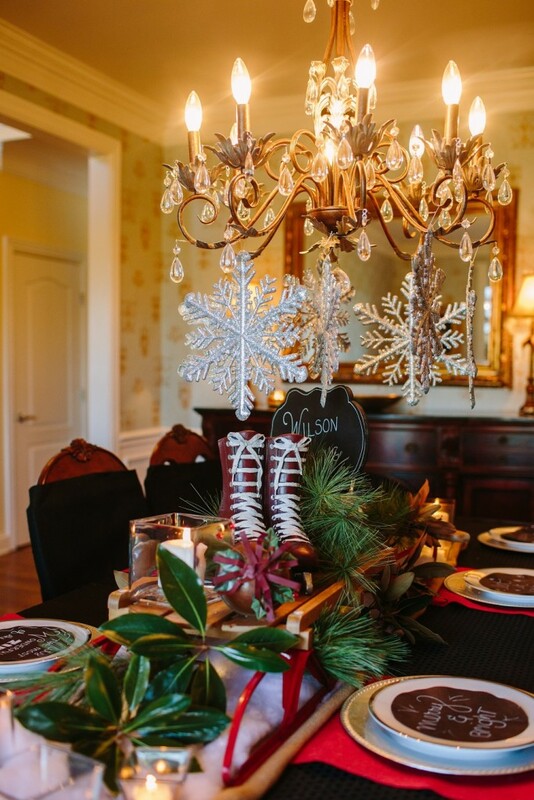 Ice skates and a sled help make a winter table festive. Details are so important! 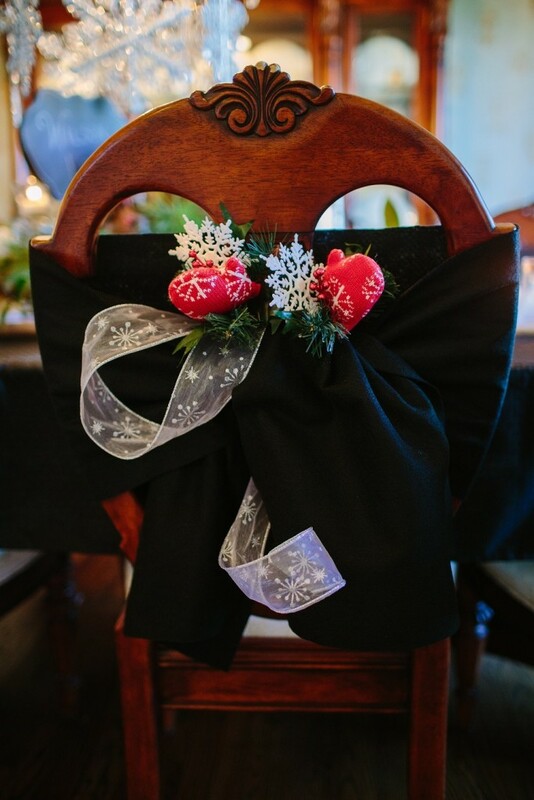 Wrapping the chair backs with wide strips of felt provided the perfect place to add Christmas picks with snowflakes and mittens to carry out the winter theme. 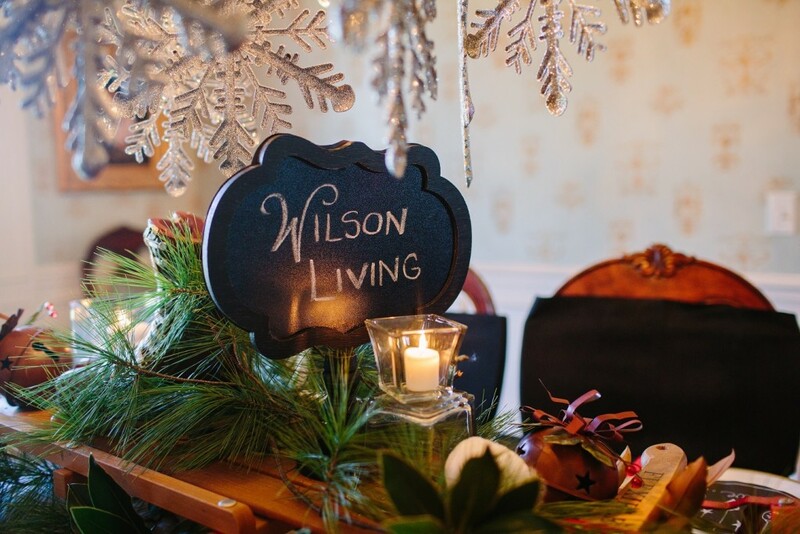 Using a chalkboard, you can change the message to welcome guests for different events during the holidays without changing the tablescape. 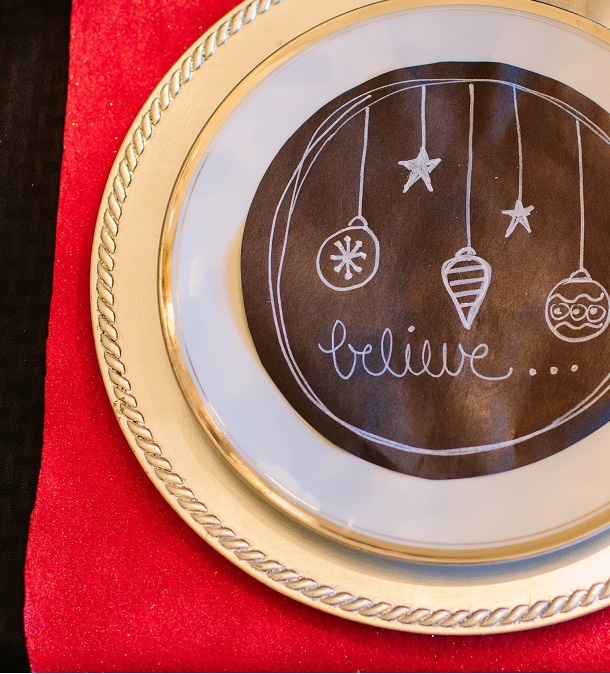 Simple chargers and white plates were dressed up a bit with chalkboard paper featuring a different holiday greeting at each setting. 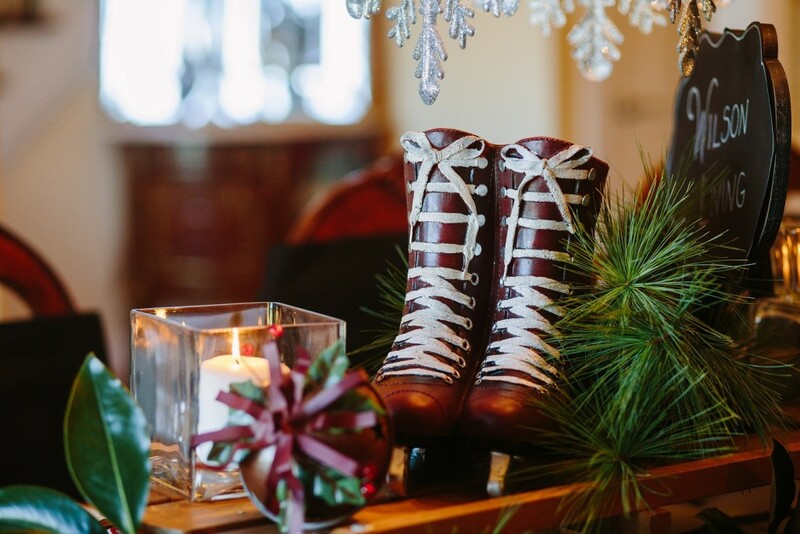 From our Wilson Living Family to yours, we wish you the most wonderful time of year! 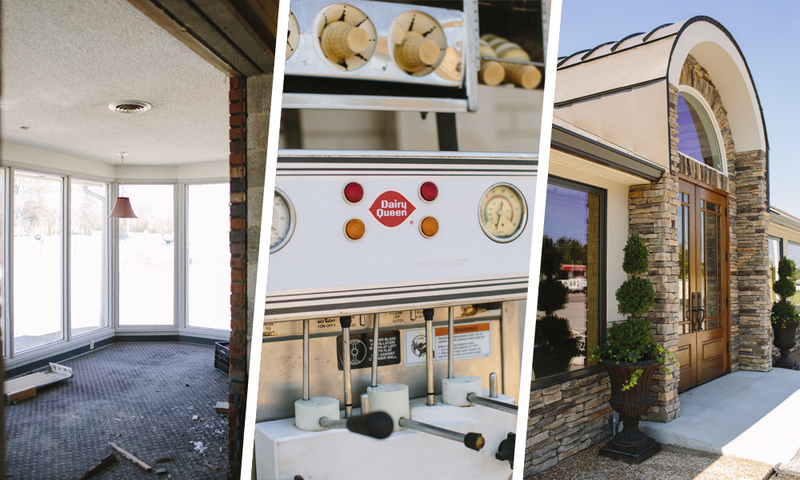 The iconic Dairy Queen building, where sweet treats and burgers were served from the early 1960’s until it closed a few years ago, is now the Mount Juliet business home of Bentley’s Heating & Air Conditioning Company. When Bill Bentley, co-owner of the company, looked for a location to expand their heating and air conditioning services into Mount Juliet, the well-known Dairy Queen building provided the perfect location. Bentley’s Heating and Air Conditioning is a family-owned business, with their original office founded in Wilson County in 1945 by Bill’s grandfather, Grady Bentley, and later owned and operated for many years by Bill’s parents, Mackey and Judy Bentley. “We are all about service,” said Bill, “and we will offer “Free Filter Fridays” at our Mount Juliet location, where on Fridays we will give a free filter to anyone who comes by to visit us. And, because the Dairy Queen reminds all of us of ice cream, we decided to give out free ice cream, too. We still have the original ice cream machine that was in the building,” noted Bentley. 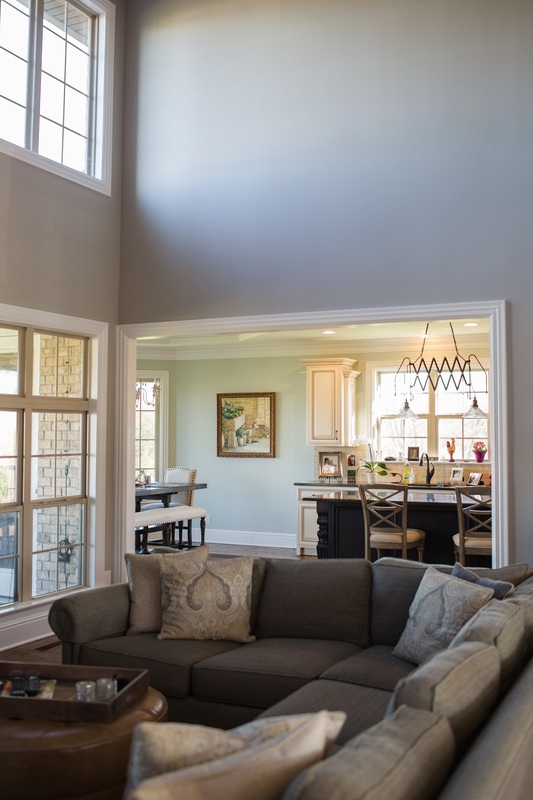 Bill and wife Stephanie sought the help of local award-winning design and construction specialist, Elizabeth Scruggs, owner of Superior Construction and Design, to assist with the renovation project. 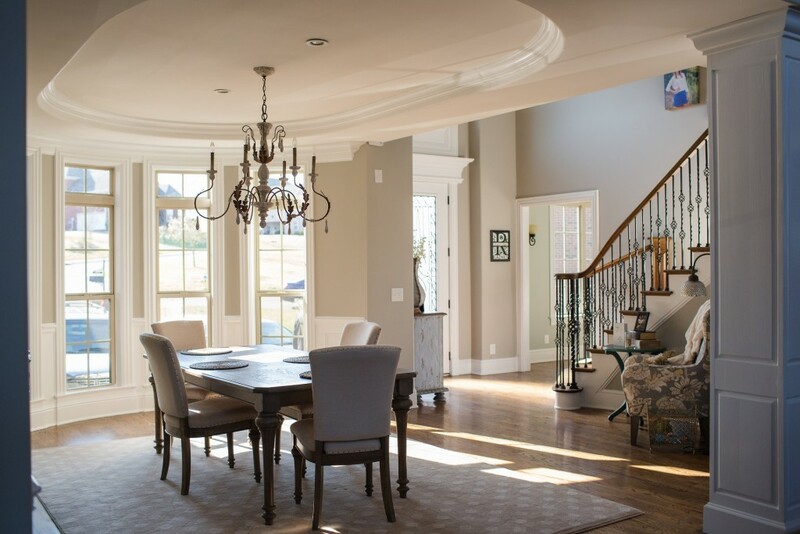 Superior Construction and Design, awarded the 2015 Best of Service Award by Houzz.com, worked with the Bentleys for about six months to complete the project. “We included a few of the original restaurant booths into the plan, and also kept the drive-thru. It’s a beautiful blend of old and new,” said Scruggs. The Bentleys want to encourage the community to stop in and visit their beautifully renovated building. “We want people to feel at home at Bentley’s Heating and Air, just like they did at Dairy Queen,” said Bill. “We are very happy with the way the building turned out, and we are enjoying being a part of the thriving Mount Juliet community,” he said. The company’s Mount Juliet location has 15 employees, with future employment expected to be about 35. For more information about Bentleys Heating and Air Conditioning, visit them at 11674 Lebanon Road and online at www.bentleysheatandcool.com, and contact Superior Construction and Design at www.superior-construction-and-design.com. One of my favorite things about the spring and summer months are flowers. I love to garden in my flower bed and share different varieties with friends. So get outside and bring some of summer’s beauty into your space. It’s good for your soul! 1. Nothing is off limits as far as a container for the arrangement. 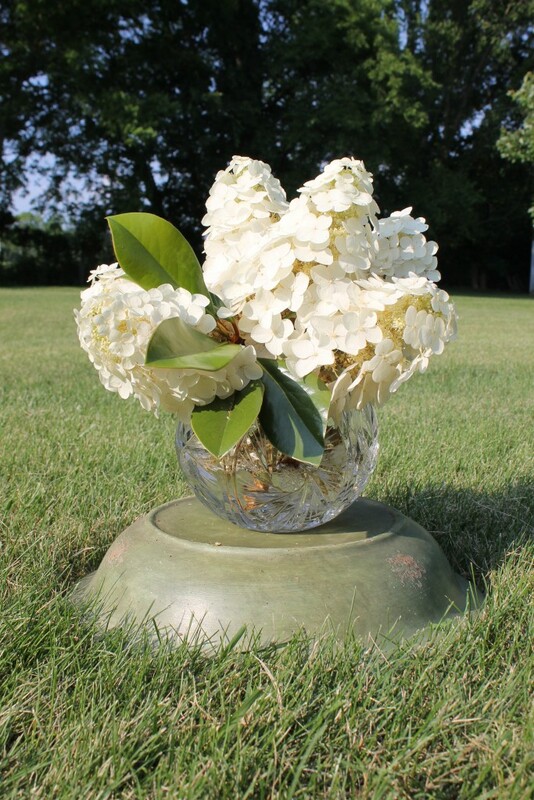 Think outside the box and use something not typically used for flowers. Here I used a crystal piece for a more formal arrangement. Oak Leaf Hydrangea with a few springs of Magnolia leaf make a simple yet stunning display. 2. I always decorate in odd numbers, and the same holds true for flowers. Odd numbers of items always make a more beautiful arrangement. Lamb’s Ear paired with Knockout Roses and Coneflowers provide just enough contrast, while the texture of the Lamb’s Ear lends a touch of softness. Working with a taller piece in the center, graduate to smaller on the sides. Keeping it a bit off center makes it look more natural and less arranged. 3. Simplicity- less is always more. I follow this when decorating any space, and the same holds true for fresh arrangements. 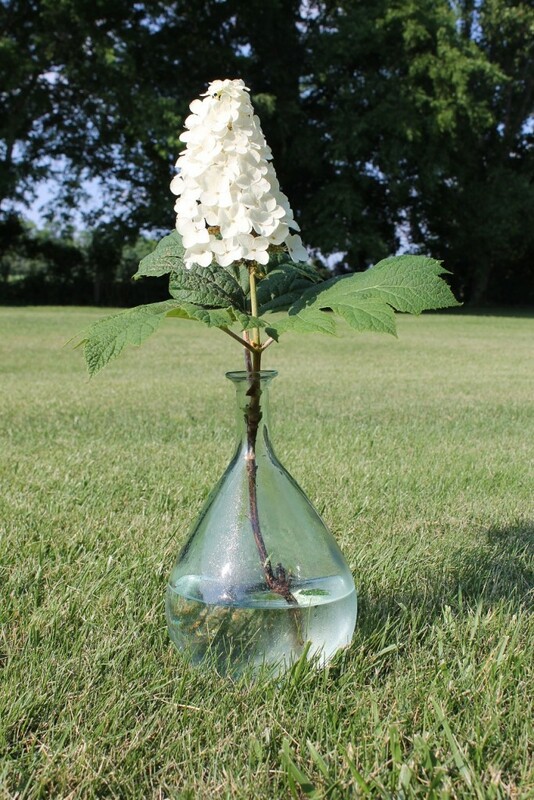 The simplicity of a single stem in a vessel can have a dramatic effect.